Fabiano Brothers decided that they wanted to convert their office lighting to LED lighting, like the rest of their facility is equipped with. They knew that the savings benefits of LED lighting were significant, but they also were attracted to other benefits of LED lighting too. 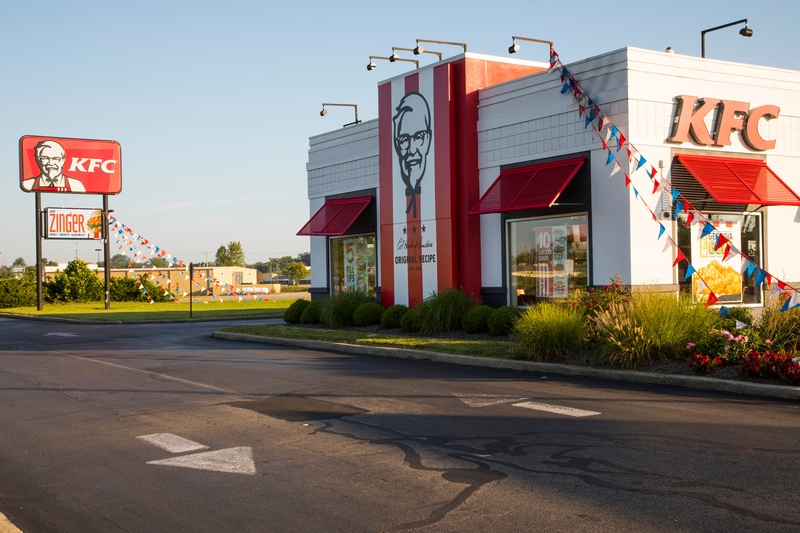 Electro-Matic Visual was able to supply the LED panel lights that are virtually maintenance free and are designed to provide employees with higher energy levels. The LED panel lights were adjusted to accommodate the workers environment. Correct lighting where employees are present has been proven to provide them with higher energy levels to help them stay focused, be more positive and more productive. 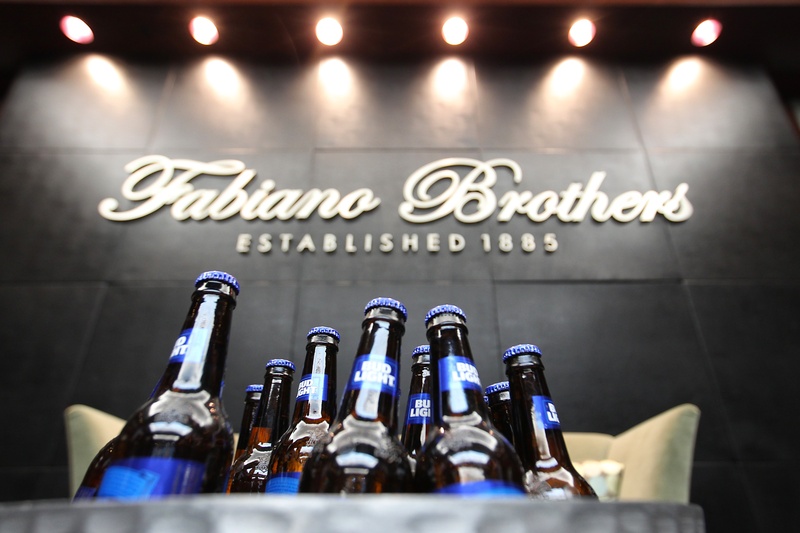 “The LED lights are much less expensive to operate, are a whiter light that gives our facility a more state of the art appearance, and have been very well received by our employees from a functional standpoint.” - John M. Bicknell II, COO, Fabiano Brothers, Inc. The LED panel lights are ideal for these spaces because of their ability to not only produce efficient light but also consistent light. Traditional fluorescent light can not be projected in a particular direction, where LEDs can. Having a consistent light throughout a given area gives a room more visibility and virtually no dead spots. Fuzzy's Restaurant in Saginaw, MI lost their previous LED sign board because of a mechanical error. Fuzzy's Experienced a decrease of 25% in business without an operating LED sign. With an unsettling feeling of not having their LED sign operating they decided to partner with Electro-Matic Visual to replace their old LED sign. Electro-Matic Visual implemented an LED sign to increase their traffic flow and to eliminate the headache of changing the message manually. 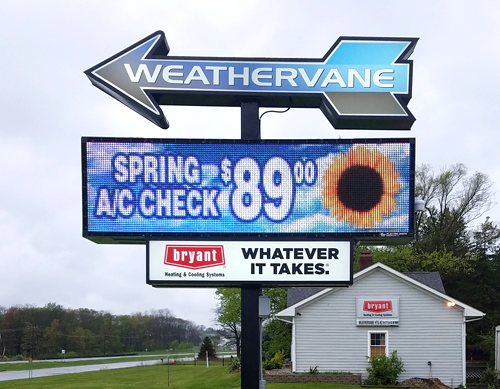 With their new LED Sign they will be able to display full color messages to ongoing traffic with multiple messages and allow them to be even more creative with their specials and seasonal treats. Fuzzy's can now continue their business operations as they were with their new LED display. This goes to show that even an established restaurant with a great reputation can loose sales because of poor signage. Electro-Matic Visual was privileged to partner with Fuzzy's to accommodate their business goals. The Dan Pfeiffer Automotive Group has several different locations throughout the Grand Rapids, MI area. The result from having so many different locations is a lot of selections of great cars, but also a lot of area to light during the after hours. 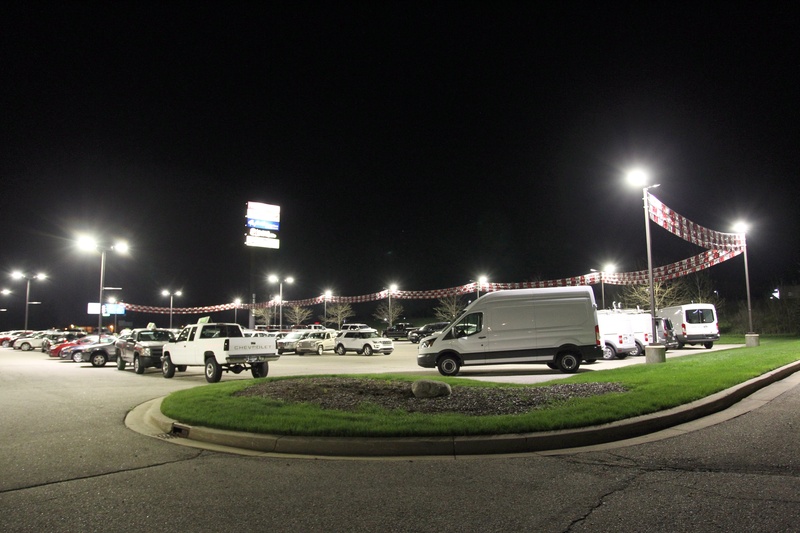 Pfeiffer Used Cars & Quick Lane Auto Center was searching for a more efficient way to increase their lighting levels in their lot, that resides directly off of Highway 131. Electro-Matic Visual stepped in to help provide a solution. After the lighting audit was determined, Electro-Matic Visual and Appearance Products worked together with Pfeiffer Used Cars & Quick Lane Auto Center to complete the installation process. “Working with EM visual has been great for our LED lighting division. I rely on them to do site surveys, photometric layouts, and recommending the best product so all I need to worry about is selling the job and handling installation. And since their products are made in Michigan I know my customer is getting the maximum rebate possible.” – Ryan DeHoog, General Manager, Appearance Products. Electro-Matic Visual and Appearance Products are happy to see that not only did Pfeiffer Used Cars & Quick Lane Auto Center receive a maximum rebate possible by buying a Michigan made product, but they are also reducing their energy savings by over a third. All 83 fixtures were swapped out from metal halide lights to Electro-Matic Visual’s LED parking lot lights for optimal savings and efficiency. Pfeiffer Used Car & Quick Lane Auto Center will continue to see energy savings throughout their estimated life time of over 100,000 hours and with virtually zero maintenance costs, their LED lights for their parking lot seem to be the perfect solution. 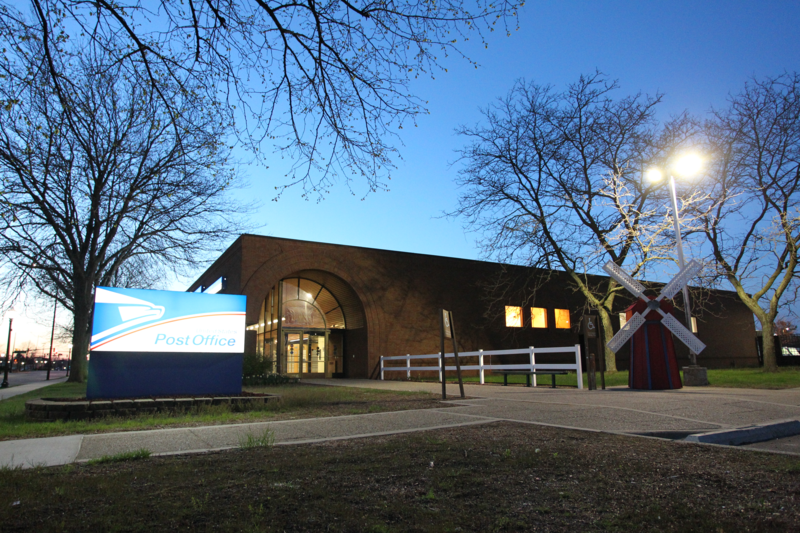 The United States Post Office in Holland, MI was seeking a more efficient way to light the outside of their facility, including their parking lot where they park their mail cars and the actual building itself. The United States Post Office needed high quality LED lighting and capable of quick and easy installation. For the turnaround for this job to happen it took the expertise help of both Haveman Electric and Electro-Matic Visual. 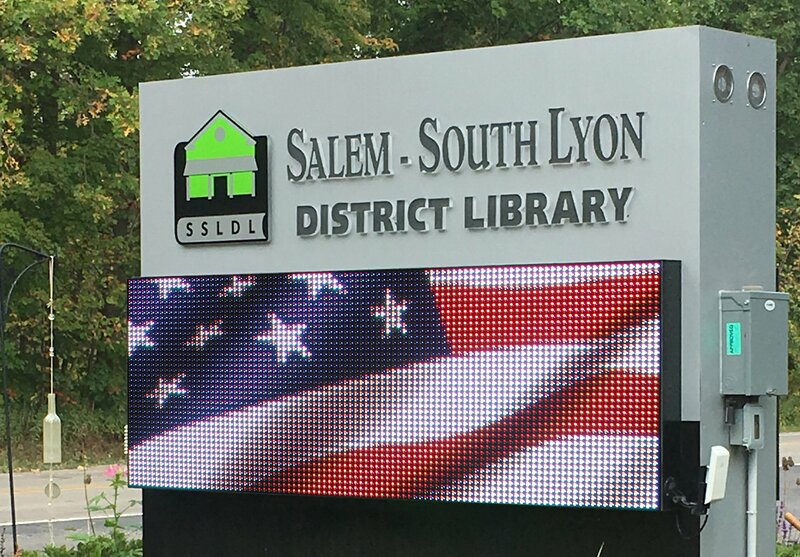 While Electro-Matic Visual provided the solution, Haveman Electric was able to receive the products and install the lights easily to quickly get The United States Post Office receiving the benefits of LED lighting. The United States Post Office in now seeing their benefits of installing LED lighting. The LED lighting will allow the Post Office to operate at a lower cost. With increased lighting levels their parking lot shines with light to help increase visibility and security.